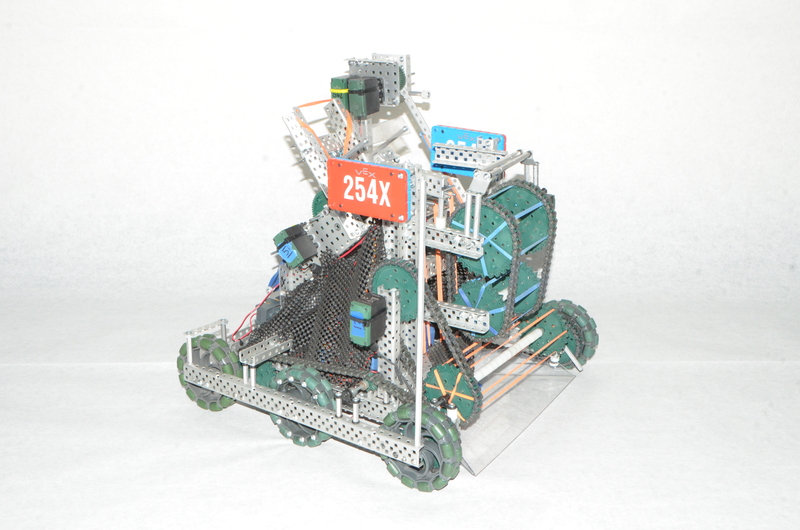 So far, Team 254’s VEX teams have been facing strong against tough competitors. The teams are hoping to get qualified into States and Worlds in the late season by going to tournaments far and wide, as well as attending the new Signature events. VEX Robotics Competition Turning Point is played on a 12’x12’ square field configured as seen to the right. Two alliances – one “red” and one “blue” – composed of two teams each, compete in matches consisting of a fifteen second autonomous period followed by one minute and forty-five seconds of driver-controlled play. Our robot is focused around flag scoring as it intakes 2 balls and quickly feeds them to our puncher. The intake is made of three rubber banded rollers which spin at very fast speeds to make sure the balls get to the puncher as soon as possible. The puncher allows us to consistently hit the flags, even at great ranges. We are also using a V5 vision sensor to make sure we always hit the flags. Our 6 motor drive base lets us drive aggressively, ensuring that we get to the game pieces before our opponents. In our past tournaments, we struggled due to the breaking of vital subsystems and a slight inconsistency in our autonomous programs. When preparing for our next tournaments, we plan to reinforce all of the vital components and edit several of our autonomous programs. Our last robot was a cap robot. We used a reverse double 4 bar. We had a u drive base. We didn’t have autonomous. At bell vex we probably did the best we could with the robot and experience that we had. We won 1 qualifier and had 2 very close games (lost by 2-6 points more or less). We had many problems with our robot. One of which was the fact that our 4 bar couldn’t lift well, we worked on the robot throughout the morning on bell vex and decided first to get rid of our cap flipper’s rotating feature as we had problems with the wire unplugging and the cap being unstable. We also decided to remove top layer of the cap flipper. After around 2 games we chose to only flip ground caps because we had trouble with the 4 bar getting stuck. Halfway through the tournament the only things our robot could do was drive, flip ground caps, and push other robots around. Even though our robot’s capabilities were minimal, we still did fine. For this upcoming tournament we don’t have much time so are only planning to do a pushbot that can maybe flip ground caps. We don’t have V5’s so we are planning to use a 10 motor drive base. We might use 1 motor to turn over caps on the ground. 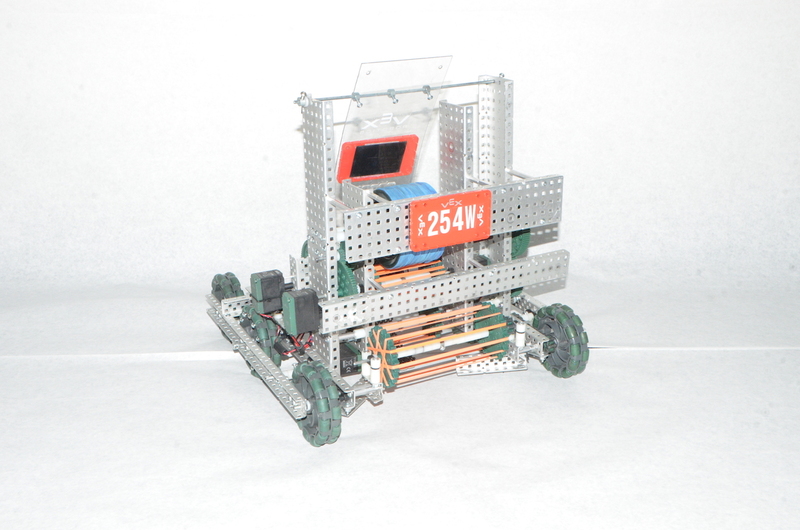 Our robot has a 4 motor and 4 wheel drive base. The robot is a cap focused robot with hook prong design allowing you to flip caps mid air and to flip caps faster then a cap 180 degree flipper. We prioritize on mesh to control cap location. 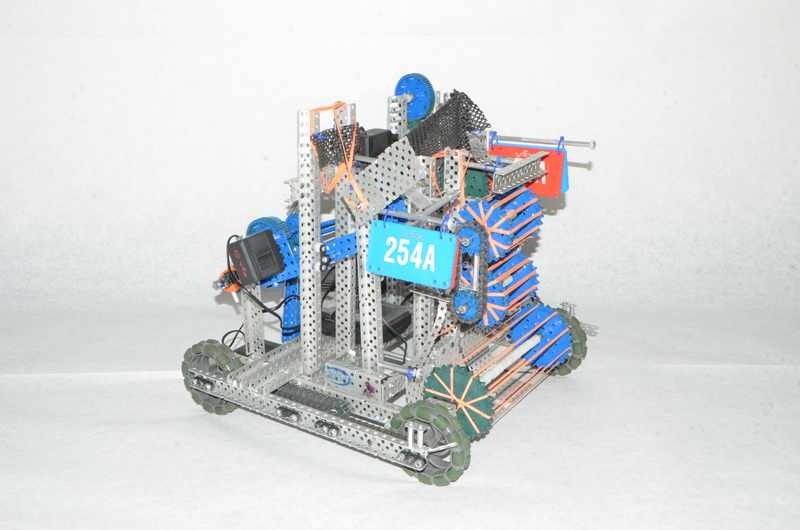 Our lift is a reverse double four bar which in vex is more efficient then other elevators. In Bell Vex, we weren’t successful due to not having enough driver practice. If we had enough practice, we would have a successful team. Last semester, we attended Bell VEX with a cap robot. The robot lift was unstable at higher heights and kept burning out. We switched to primarily playing defense on ball robots and flipping ground caps, allowing to us to get one win and one tie out of six matches. After the tournament, we felt that ball robots were better due to faster scoring and the relative ease descorers had in descoring caps scored on poles. In other words, it would take significantly longer to score caps on poles than for enemy robots to descore them. 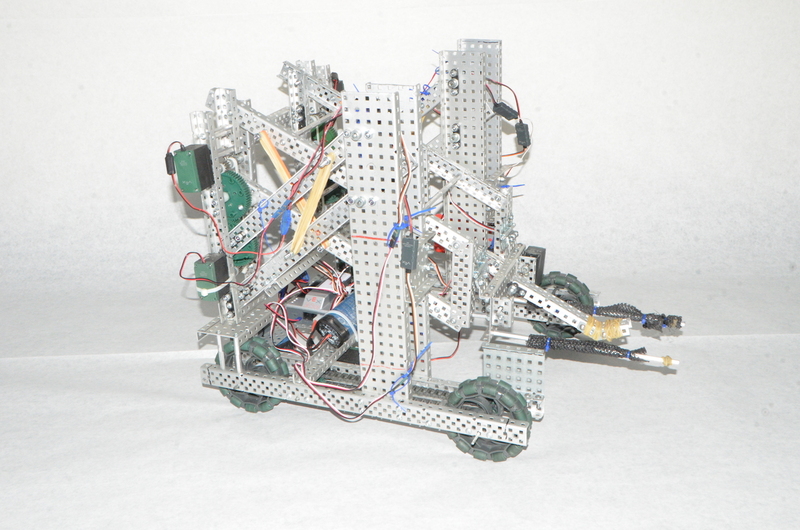 Thus, we shifted to a ball robot that we are currently building. We have designed a flywheel with a primary intake and two smaller intakes (functioning as indexers). The indexers allow us to shoot when the flywheel is at the correct speed (depending on our distance from our target). We also plan to use a vision sensor and some physics to program the robot to automatically calibrate its flywheel speed based on its distance from the target. We hope that it will be able to score balls from anywhere on the field. We are aiming to compete in a February tournament and advance to states by either winning the tournament or by getting a high skills score. 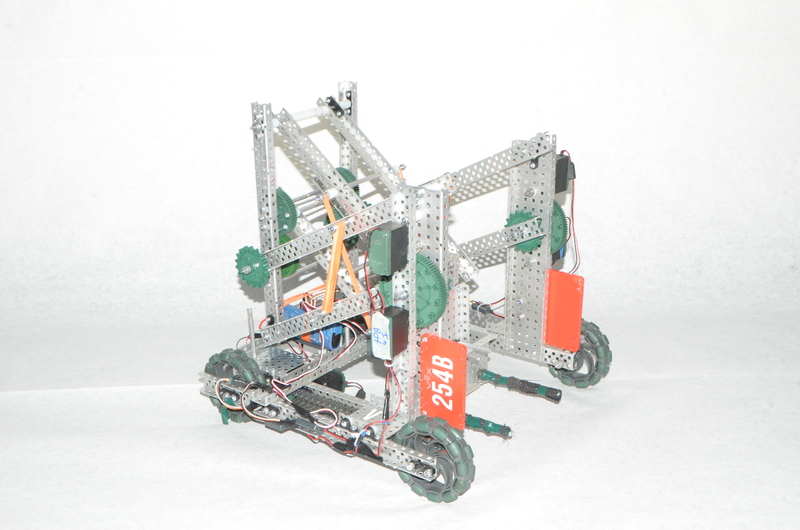 Our robot is a flag based robot, with a 6 motor drive for aggressive game play and a 2 ball catapult for maximum point scoring efficiency. The two ball catapult allows us to hit two of the high flags in one shot. It also provides us the utility to shoot a singular ball at various ranges if needed. We have a wide intake, which allows us to pick up balls in hard to reach corners and flip caps easily. 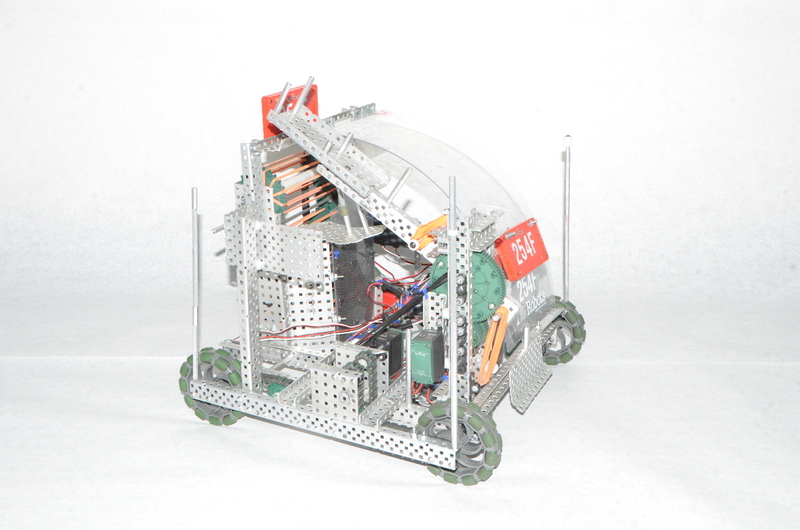 Our 6 motor drive allows us to fight for ball control and defend against other robots effectively. In our past tournaments we had difficulties in scoring faster than robots with the V5 system as they would push us around and shoot balls more effectively. Despite these losses, in our latest tournament we still had the old system and made it to quarter finals. 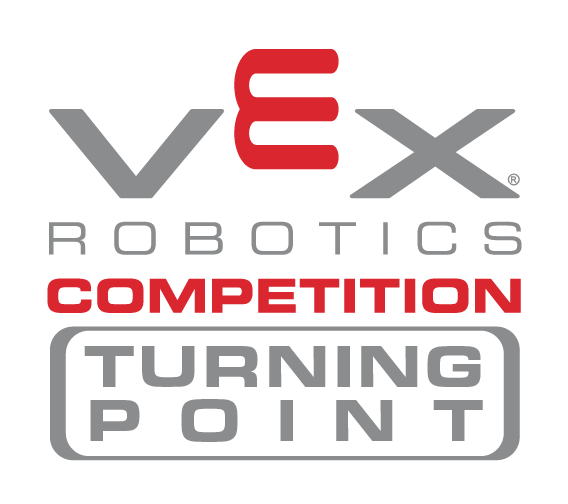 This proved that our robot design had great potential and we have an excellent chance of winning our next tournament with the V5 system. Our robot intakes balls and shoots them with our 4200 rpm flywheel. So far, the season has been a series of iterative designs, going from a cap only bot to a ball only bot. Although we have not won any competitions yet, we learned a lot about the design process and all the techniques in creating a successful robot, especially build quality, good programming, and up-to-date engineering journal entries.  Team 254X is a vex team from bellarmine college preparatory in the 2018-2019 season. We have competed in tournaments at home in bellarmine, at Tracy, Richmond, and San Diego. We have taken a lot of risky design choices that paid off in the recent tournaments, the main one is using a centered puncher and intake. We have been a 393 team in every tournament so far, and have used some 393 advantages to try to win against v5 teams such as a split control intake and a auton downscaler. 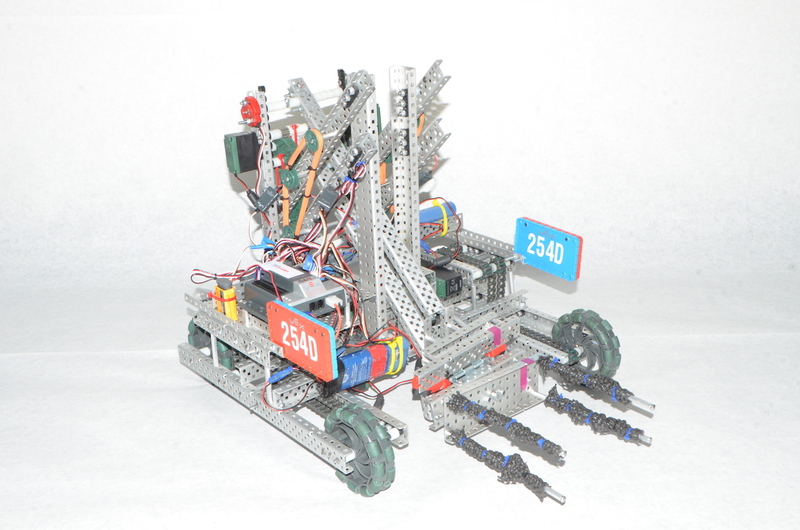 In tournaments, we have had no success in bell vex due to risky gambles that we refined in our Tracy tournament and made it to the quarterfinals there. In all, we have some tournaments left and with v5, we should be on track for a win and a run at states.